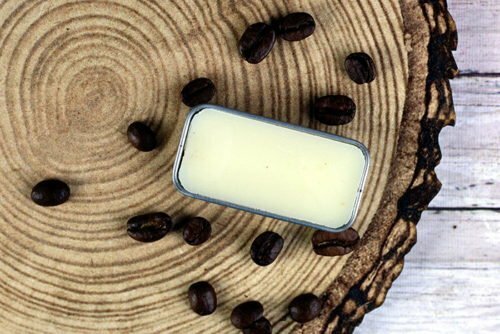 This easy coffee lip balm recipe uses an infused carrier oil for all of the flavor without the mess of using coffee in the recipe. I’m combining two of my favorite things in my coffee lip balm recipe: lip balm and coffee. My poor lips get burned in the summer and dry in the winter, so they always need a little bit of extra love. I have made several kinds of lip balms in the past, but I couldn’t figure out how to get a coffee flavored lip balm without actually adding coffee. I learned about infusing herbs and oils, so I decided to try it with coffee. By infusing the oil with coffee grounds, I’m able to get the scent, flavor, and benefits of the coffee in this coffee lip balm recipe without creating a mess or using an unnatural flavor. If you’re new to infusing oils, it’s a great way to get the benefits of an herb, or in this case coffee, without using the herb (coffee) in the final product. If you’re making soap or a bath tea or something similar, you may not mind using the herb. However, if you’re making a lotion, lip balm, or something where the herb (coffee) can clog drain pipes, then you can infuse an oil. This gives the oil the properties of what you infused it with without making a mess in the final product. When you infuse coffee and oil, it gives the oil a rich, darker color and also makes the oil smell like coffee, which is what I wanted for this coffee lip balm recipe. To infuse an oil with an herb or coffee, simply place the herb or coffee grounds in a mason jar and cover with the oil. I used the same fresh coffee grounds that I use to brew my morning coffee. How much of each do you need? This is not an exact recipe. You want the oil to completely cover what you’re infusing it with. So if I want to infuse 4 ounces of oil, I’ll fill an 8-ounce jar just under half way and cover it with oil. When I’m done, I’ll have about 4 ounces. After you’ve covered the coffee grounds with the oil, let it sit for two weeks. I pick up the jar and swirl around the oil every day so it mixes together well. After two weeks, use cheesecloth to strain out the coffee grounds and discard them. You can also use your slow cooker to infuse oils in less time. The great part about using a slow cooker is that you can infuse several different combinations of herbs and oils at the same time. If you want to use coconut oil in a different recipe, this is how you would infuse it. Place a towel on the bottom of your slow cooker and place your jars on top of the towel. Carefully add water until it covers the herbs or coffee grounds and oil in the jar, but be careful that no water gets in the jar. Leave the jars uncovered. Also leave the lid off of the slow cooker because it can collect condensation that can drop down into the jars. Turn the slow cooker on low and cook for 4-6 hours. Strain the herbs or coffee grounds out of the oil with cheesecloth and discard them. For this coffee lip balm recipe, I used a combination of oils. Don’t be afraid to experiment with different carrier oils and other herbs. If you have oils leftover, label them in jars and use them in future recipes. This coffee infused oil would be a great oil to use in my caramel coffee sugar scrub recipe. This is a fairly simple recipe in a 1:1:1 ratio of ingredients. I really like that because it’s easy to remember and easy to make a large batch. I’ve found that this ratio is wonderful for both lip balm pots and tubes because it’s not to firm for a pot and not too soft for a tube. For the oil, I used a blend of avocado oil and sunflower oil. I really like avocado oil for the lips because it’s very moisturizing for dry, chapped lips. Sunflower oil is a lighter oil, which balances out the heavier avocado oil. Sunflower oil is also said to be anti-inflammatory, so it can help with sunburned or chapped lips. You can use your favorite liquid carrier oil to infuse the oil. I like sweet almond oil, fractionated coconut oil, and grapeseed oil in lip balms. I like shea butter in my lip balms because it nourishes the lips, yet it doesn’t leave your lips greasy. You can also use cocoa butter, but you may need to add a little extra oil or reduce the beeswax. Weigh the ingredients using a scale. This recipe will not work if you use liquid ounces. Combine the infused oil, shea butter, and beeswax in a double boiler. Heat over medium low heat until melted. The beeswax will seem like it’s not melting, but it will. Keep stirring to prevent clumps so it melts quicker. Pour into lip balm pots or tubes. 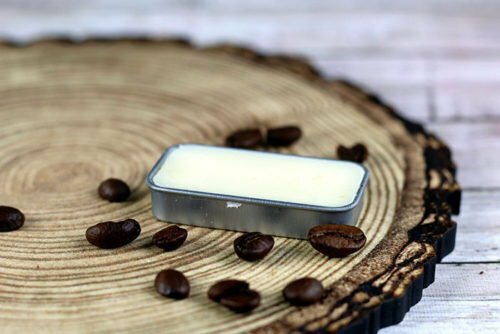 This coffee lip balm recipe makes about 3 ounces of product, so it should fill about 20 lip balm tubes. If you use lip balm pots, it will depend on the size of your containers. While this recipe is great on its own, you can also modify it to make different flavored coffee drink inspired recipes by adding different essential oils. Check out my pumpkin spice latte lip balm recipe and my mocha latte lip balm recipe for more inspiration. Or check out these other lip balm recipes from Soap Deli News. You can also learn more about the different carrier oils available to use in your recipes in my book Carrier Oils: A Beginner’s Guide to Using Over 40 Carrier Oils in Bath and Beauty Recipes. You can follow Cari on Pinterest, Instagram, Twitter or Facebook. Yes, you can! They are just a little trickier sometimes to strain.